Last week I was following the progress of the International Summit on Human Gene Editing, which took place in Washington between 1 and 3 December, 2015. On the last day, I was looking at my twitter timeline and saw that Megan Allyse (a former PhD student) had posted information on a special issue devoted to gene editing published by the American Journal of Bioethics. This issue not only contained an article by Megan herself on reproductive CRISPR, but also an article by Meaghan O’Keefe and others on gene editing and metaphors. For a long time, I have been interested in how metaphors are used to make genetics, genomics, microbiomics, epigenetics and synthetic biology public. So I was of course excited to read this article, especially since I had quite recently blogged about the ‘book of life’ metaphor in the context of CRISPR gene (genome) editing. As people who read this blog know, I am a keen observer of metaphors in public discourse and I think that metaphors are extremely important in science and society. Metaphors provide us with ways of seeing the world in certain ways, for good or for ill. They represent “inferential shortcuts” and help us form and sustain basic “reasoning patterns” as O’Keefe et al. have pointed out quoting work by Dncygier and Sweetser (2014) (O’Keefe et al., 2015: 4). If we want to engage openly and critically with advances in genomics and gene editing in particular we should keep an eye on the language we use to speak about these developments. Metaphors can open our eyes to new developments but they can also blind-side us. As this is a bit of a long read, here are some sign posts. First I’ll briefly summarise some of the insights from the O’Keefe et al. article based on analysing American press coverage of CRISPR (but obviously you should read the article yourself! ), then I’ll do a rough and ready run-through the UK press coverage. Both the US and UK press seem to use similar metaphors (but more research is needed). I’ll then home in on the ‘designer babies’ metaphor and urge people to think about responsible language/metaphor use. O’Keefe and her colleagues have been the first to look systematically into the role of metaphors in shaping the emerging public meaning of gene editing by investigating the use of metaphors in American newspapers and popular science publications. They searched a selection of American newspapers and popular science sources and found that CRISPR was first mentioned in their sources in January 2013 and they stopped their search on July 11 2013. They found 45 articles dealing with CRISPR, 22 from newspapers and 24 from popular science publications, such as Popular Science for example. These articles were analysed qualitatively and metaphors were extracted. The overarching metaphors they found were both old and new ones. The old ‘blueprint‘ metaphor, which has been used for the human genome for decades, is still in use, as well as the ‘code’ and ‘map’ metaphors. Newer ones are ‘gambling’, ‘mechanism’, ‘medicine’ and ‘origami’ (some, i.e. my son, tell me that the metaphor of ‘kirigami’ might be better in this context, as it includes cutting of the paper, rather than solely folding the paper). ‘War and fight’ metaphors were found as well, as in ‘CRISPR system to block the attack of…”. Under the overarching metaphor of ‘medicine’ we find talk of ‘scalpel’, ‘surgery’, ‘snipping’ and so on. The authors also say that the most common metaphor they found is that of the genome as ‘text’ and that the idea of ‘editing’ appears in nearly very article. There are of course also references to ‘cutting and pasting’ (p. 7), ‘scissors’ and so on. A new metaphor found in the articles they studied is that of ‘targeting’ (a rather popular metaphor in the discourse of nanomedicine), used “both to emphasize precision and to warn of the dangers of unintended cuts”, that is, ‘off-target’ mistakes in the editing process (p. 8). (Sir Mark Walport, the UK’s Chief Scientific Advisor, recently extended that metaphor nicely in a thoughtful newspaper comment on gene editing when he asked: “whether this is a magic bullet or whether there will be off-target effects”, 9 December). Like John Avise in 2001, the authors speculate about whether one can find better metaphors, such as ecological ones that might capture the complexity of interfering with genes and genome more accurately (p. 8). But can the ‘editing’ metaphor be put back into its metaphorical bottle? I doubt it – the authors of the article and I myself are, for example, using it in the title of our article/post! However, I’d advocate that scientists who use it take care to contextualise it and provide some nuanced information about the metaphor’s limits. I wish I had time to do an equally thorough analysis of the UK newspaper output on gene editing as O’Keefe et al. did for the American press, and one day I might sit down and do this. In the meantime this nice paper inspired me to take a quick look at things. Between 2007 and 2012 ‘CRISPR’ seems to have been used mainly in press releases and news-wires about research dealing with bacteria (viruses, phages), in particular the microbial immune system. Here we find some of the ‘war/fight’ metaphors discussed in O’Keefe et al.’s article such as bacterial defense system, how bacteria fend off invaders and so on. Research is linked to the microbiome project as well as research into antimicrobial resistance. As a recent article in New Scientist pointed out, the new gene editing technique is “derived from a mechanism that bacteria use to fight off viruses”, an unexpected spin-off of basic science. On June 28 2012 there is a first headline announcing “Programmable DNA scissors found for bacterial immune system discovery could lead to editing tool for genomes” (States News Services, June 28, 2012). More and more articles begin to discuss this new ‘gene probing’ or ‘gene editing tool’ (also a tool that can turn genes ‘off and on’). 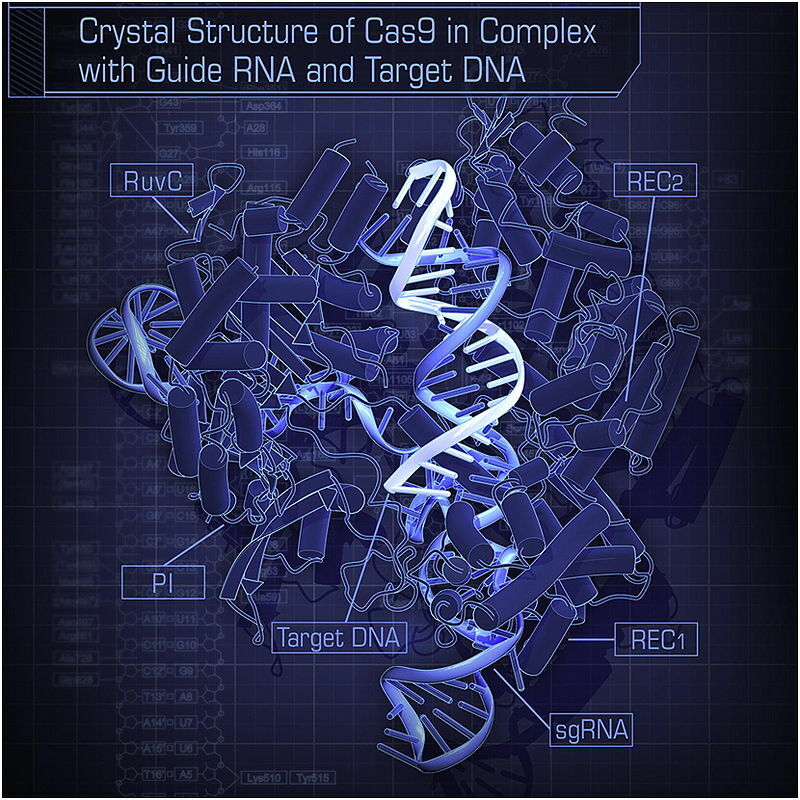 In August 2013 the company Sigma Life Sciences was reported to have launched a CRISPR/cas editing tool (PR Newswire). Genes are now seen as almost under the ‘control’ of scientists. In November 2013 mainstream media, the UK’s Independent in particular, began reporting on gene editing, at the same time as scientists called for a public debate. This debate has now started in earnest with the recent gene editing summit. 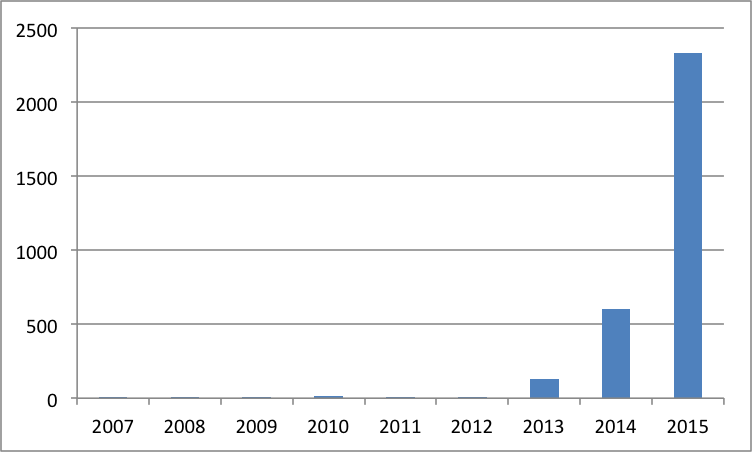 Here you can see the rise in interest over time from 2007 to 4 December 2015. But what about the UK coverage of gene editing in particular? As one can see, the Independent seems to be in the lead in covering gene editing, followed by the Daily Mail and the Guardian. In the end the summit last week “ruled out a ban on modifying human embryos that are destined to become people. But the experts made clear that altering the DNA of human embryos for clinical purposes was unacceptable given the unknown risks today and noted that even the most compelling cases to use the procedure were limited.” (Guardian, 3 December). But what sort of metaphors were used in the UK press over the last two years? 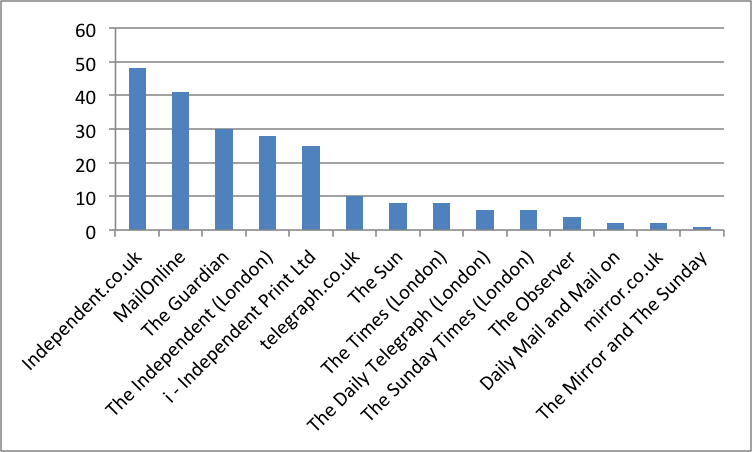 I can, of course, only do a very cursory analysis for this blog post, based on quickly scanning the headlines of the circa 200 articles that were published in the UK press up to the 4th of December. Two routine metaphors in reporting on scientific advances were used frequently, namely that of ‘breakthrough’ and ‘revolution’. Such metaphors have been critically analysed in the past by Nik Brown and myself. The word ‘editing’ is of course used throughout the press coverage, and we hear about editing (the DNA of) monkeys, wheat, woolly mammoths, pigs, dogs, embryos, insects, mosquitoes, even (metonymically) “humanity” as a whole (The Independent 24 April 2015). On March 11, 2015, the Mail Online speaks of “cellular scissors”. In this context, the phrase ‘cut-and-paste’ is used quite frequently, as in “cut-and-paste DNA (Guardian 30 January, 2014); “cut-and-paste gene slicing technique” (Mail Online, 31 January 2014); “’cut and paste’ technique for precision editing of human genome” (i-Independent, 28 July, 2015). As observed in the analysis of American press, precision is claimed to be possible. On 21 April 2014 The Independent talks about “pinpoint accuracy”. There is talk of a “gene correction technique” (Independent, 5 August, 2014), of “gene repair” (Mail Online, 6 November, 2015), of “find, replace – and cure” (Guardian, 2 September, 2015), of being able to “upgrade our DNA” (The Observer, 10 May, 2015). All this conjures up images of control even, as a Sunday Times headline proclaimed, a “Battle for control of gene editor that rewrites species” (6 September, 2015) – using the ubiquitous metaphor of reading, writing and editing the genome as a text. However, quite early on, the Independent’s Editorial, published on 6 November 2013 (together with Mello’s and Connor’s articles mentioned above), cautions against conjuring up the spectre of the metaphorically named ‘designer babies’. Designer babies have loomed large in ethical debates about gene editing. On 20 January, 2015 The Mail Online carried the headline “Designer babies could one day be created ‘with 100% efficiency’ says leading scientist – and warns society needs to think through the consequences”, quoting, I should stress a scientist, namely, “Dr Tony Perry, a geneticist at the University of Bath”, who “said that society needed to be prepared for the day parents can choose certain traits in their children.” The Times had a headline: “GM embryo brings designer babies a step closer” (24 April, 2015); and The Mirror talked about “designer baby fears” (18 September, 2015). Reporting on the conclusions of the recent summit, the Mail Online reported “’Designer babies’ are ruled out FOR NOW – but experts fall short of banning use of gene editing in humans in the future” (4 December, 2015). Even New Scientist couldn’t quite stay away from the topic of designer babies in an article that online carries the headline “Will CRISPR gene editing lead to designer babies?” (2 December, 2015). In the print version the title is: “The Life Editor”. Talking about banning things… I think it will be impossible to ‘ban’ the metaphor ‘gene editing’, however misleading it might be in conjuring up visions of precision and control. We should however ‘ban’ the metaphor designer babies, I believe, as jokingly suggested by Megan Allyse in a recent tweet (4 November) (she used the word ‘eliminate’, not ‘ban’). The metaphor of designer babies evokes images of being able to control all human traits and tweaking them at will, which is simply scientifically impossible. I agree with A Cecile JW Janssens who wrote a very good piece for The Conversation entitled “Forget about designer babies – gene editing won’t work on complex traits like intelligence”. We should not only try to reflect on the potential impacts of science and innovation on society when, as we are now all supposed to do, engaging in ‘Responsible Research and Innovation’. We should also reflect on responsible language use! As Christoff Kueffer and my friend and colleague Brendon Larson have argued, “metaphors should be carefully chosen and evaluated alongside empirical evidence, because they shape data interpretation and how science influences society” – and, I would add, how society influences science! We should also not forget the power of visual metaphors. Scissors are becoming quite ubiquitous when reporting on gene editing for example. Calling for a social and ethical debate about CRISPR and gene editing is not enough. We have to understand not only how this new technology really works, but also how it is being socially, culturally and metaphorically framed – and most of all what the political implications of such framings are. Focusing on designer babies might not be conducive to the global ethical debate that people are yearning for. PS: If somebody wants to carry out an analysis of metaphors used in the context of the emerging debate about ‘gene drives’, they could start with this article entitled, nicely metaphorically “Gene drives spread their wings” (and have a look at the visual metaphor too!)! Research into gene drives has been overshadowed by debates about gene editing, especially human gene editing, but also deserves social, political and linguistic attention.